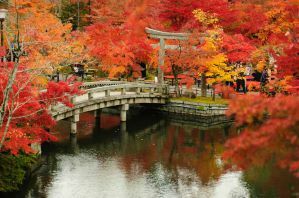 Japan is a notoriously expensive country to visit, and accommodation is no exception. If you're looking for affordable options, hostels are available in most cities and the prices are typically less than budget hotels, particularly for solo travelers. There are also more unique options in Japan, such as capsule hotels and ryokan inns. Capsule hotels, as their name implies, focus on saving space by letting guests reserve a "capsule". These capsules are usually about 2x1x1 meters in size and are stacked in rows and separated by gender. Ryokan inns are traditional guesthouses that are often in wooden buildings with gardens and picturesque settings. Many ryokan inns also have public baths. 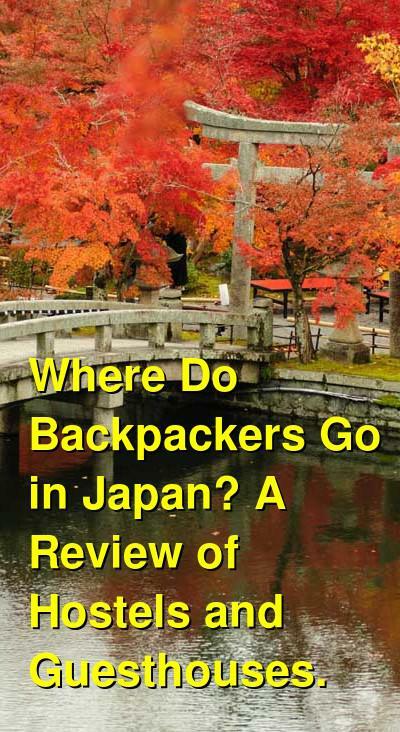 Where do backpackers stay in Tokyo? Lots of backpackers choose to stay in Asakusa. This area has a long history and is most notable today as the location of Senso-ji, which is a famous Buddhist temple. Around the temple there are many tourist shops where you can pick up souvenirs or snacks. If you want to experience a bit of old world Tokyo, then Ueno has a lot of traditional homes and narrow streets. Ueno Park is one of the largest parks in the city and it's a great place to spend some time. Inside the park is the Ueno Zoo and the Tokyo National Museum. There's also a nice street market in the area. Shinjuku is a well known business district in Tokyo. This area has the tallest skyscrapers as well as many upscale restaurants and bars. The area's nightlife is also very active. Shibuya Station is known as one of the busiest commuter stations in the world. Just outside of the station is the famous Shibuya Crossing, which is considered the world's busiest crosswalk. Many tourists come to this area just to see the impressive sight. If you're visiting Tokyo for the nightlife, Roppongi is one of the most famous neighborhoods for foreigners. There is no shortage of nightclubs in the area and most stay open into the morning. The area is a bit more mellow in the daytime, with offices and shops throughout. Ginza is known for its high end shopping. It's one of the most expensive places in the world and there are many famous brands available including Gucci, Channel, and Louis Vuitton. Just two stops away is the famous Tsukiji Fish Market. If you're shopping for electronics, Akihabara is the place to visit. There are more than 200 small electronic shops in the area, but there are also a lot of arcades and video game stores. Marunouchi is where you'll find the JR Tokyo Station, so you'll likely pass through this neighborhood at some point. As a transportation hub, it makes a convenient base if you plan to travel around a lot. The neighborhood is located in the heart of Tokyo, and it's a business district with many older office buildings. On the western side is the Imperial Palace and the East Garden. Harajuku is a fashion district in Tokyo. It's a popular place to visit on Sundays when young people hit the streets wearing the latest trends. Also nearby is Yoyogi Park and Meiji Jingu Shrine. Where Do Backpackers Stay in Kyoto? Downtown Kyoto is a good place to base yourself in the city because it's convenient and easy to walk to many attractions. Kawaramachi and Shijo Streets are great for shopping during the day. At night, the bars and clubs offer a lot to do with plenty of places to grab a drink. Higashiyama is one of the most historic parts of the city. This is the best area to experience old Kyoto. The streets are charming and there are plenty of shops and restaurants that are often geared towards tourists. If you want to experience some of the old charms, then this is the area to visit. The area around Kyoto Station is another popular neighborhood. There's plenty of shopping and dining opportunities and you'll find both foreign travelers and business travelers in the area. Many of the buildings are modern and cater to businesses. There are also arcades, and department stores around. Where Do Backpackers Stay in Osaka? Namba is in the southern part of central Osaka. This area is a great place to base yourself as there is no shortage of entertainment venues, shops, and restaurants. It's a popular area for tourists, who enjoy the vibrant atmosphere. The area is also close to the Kuromon Ichiba Market, which has more than 200 stalls that sell all kinds of things. Namba is also a good area because it is connected by many different transportation links. It's easy to get almost anywhere from here. Also in Osaka's downtown area, Umeda is a shopping district with lots of high end stores. There are impressive office buildings and sleek shops that are worth wandering through, even if you can't afford to buy anything. Budget travelers typically prefer to stay in the more affordable Namba area though, as accommodation can be quite expensive in Umeda. There are a few hostels scattered around, so if you really like the atmosphere, you can probably find a budget hostel where you can crash for a night or two. To the southeast of the city is Tennoji. This is an area that has been gentrified in recent years, but some of the older character still remains. The area is also where you'll find the Shitennoji Temple, which is one of the oldest in the country. There is also plenty of shopping and dining opportunities nearby. Tennoji is a bit more affordable than some of the other neighborhoods, and it is well connected by public transportation, so if you're on a tight budget, it might be a good option. This area is most convenient if you're planning to spend time at Universal Studios or Osaka's world famous aquarium. Where Do Backpackers Stay in Hiroshima? This area is convenient for arrival and departure. There are malls and restaurants around and plenty of accommodation options to choose from. There are also trams that can take you directly into the city center. These areas are some of the more popular places to stay in Hiroshima. There's no shortage of accommodation options and there's also plenty of shops and restaurants around. Peace Boulevard, which leads to Peace Memorial Park, is to the south of the area. These areas are known for their neon signs and lively entertainment. There is plenty of budget shopping around and the bars come to life at night. These districts are centrally located and have plenty of restaurants and a large shopping mall. There are plenty of affordable places to stay in the area and this is a good neighborhood to base yourself.